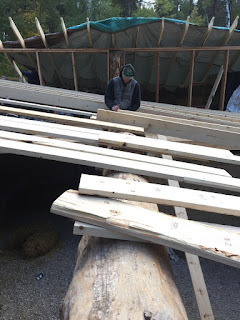 We have been hard at work this year on Spiritwood Natural Building’s headquarters a.k.a our balecob house which is why blog posts have been few and far apart. 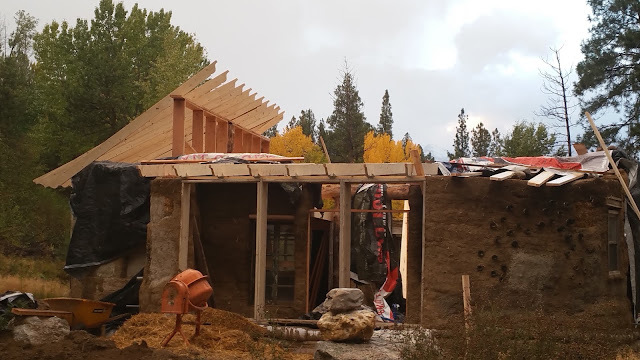 Now that the cold weather is here and our roof is on, we can slow down a bit to give some long overdue updates on the shape and function of our new home. 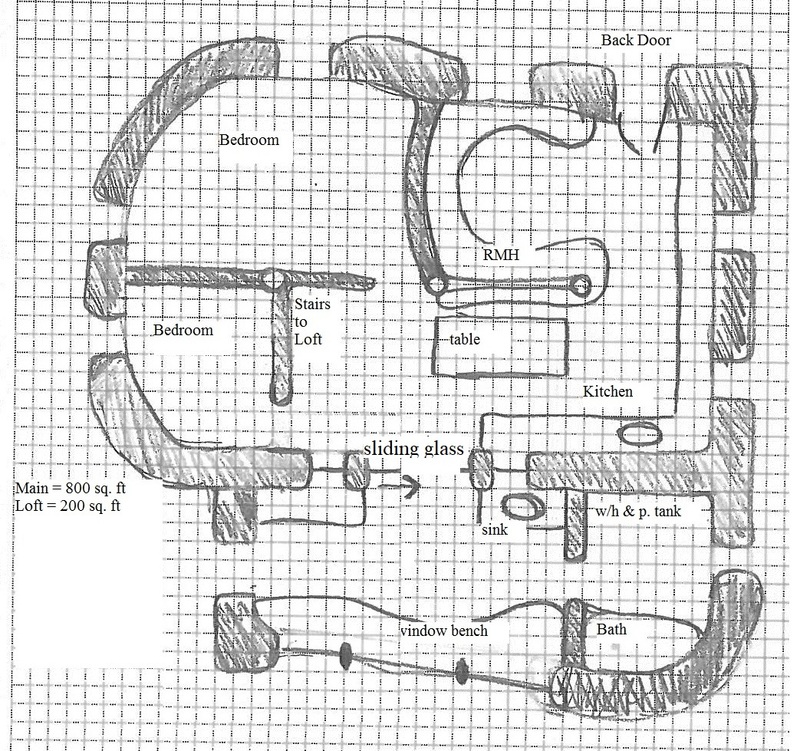 As can be seen in the floorplan below, this house is much larger than our current cob home--more than double the size! I’m extremely happy with the amount of work we were able to complete in a single year while both holding down full time employment. I have to be honest though, it was an extremely difficult year to get this far in our build. It can never be stressed enough that building small is the wisest decision any budding natural builder can make. From April to October we easily invested 30-40 hours a week to this build on top of our “paying” jobs. By the time we got the roof on, we were both mentally and physically exhausted. Hooray winter; a forced break! I won’t go into detail on each moment of the build, but save some of the technical information for later posts; otherwise this post would go on for ages. So what did we get done? 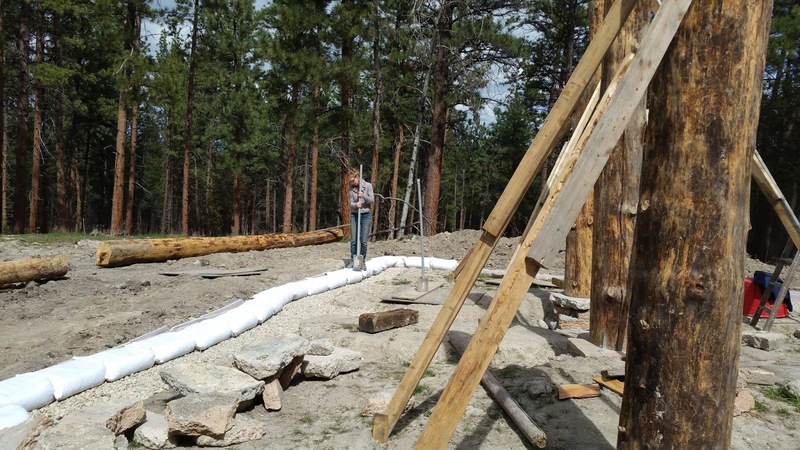 We opted to build an earthbag foundation for this house on a rubble trench. The alternatives would have been collecting enough urbanite or field stone for a stacked foundation, or a poured concrete foundation which is both expensive and terrible for the environment. This was our first earth bagging experience and definitely not our last. 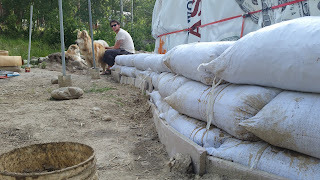 Although very physically taxing, bagging is a speedy process once you find a groove, fairly inexpensive, and is composed mostly of natural local materials. While our first cob home was completely built with cob material from the build site, the new house was built with a combination of strawbale and cob walls. 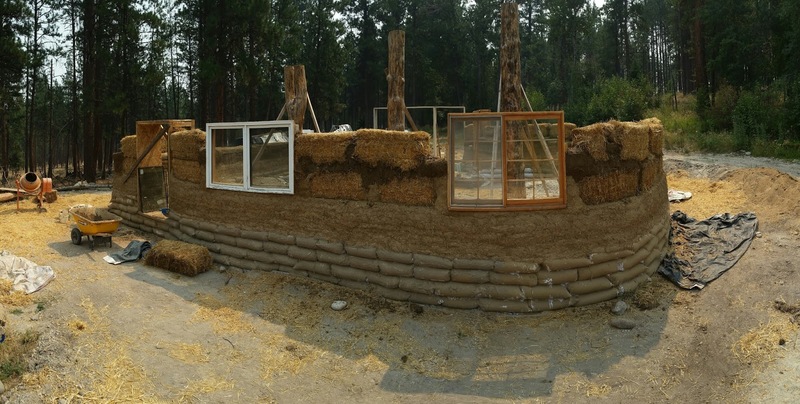 Strawbale walls bearing the direct weight of the roof is called Nebraska style or load bearing walls and is not commonly used in the code friendly home. 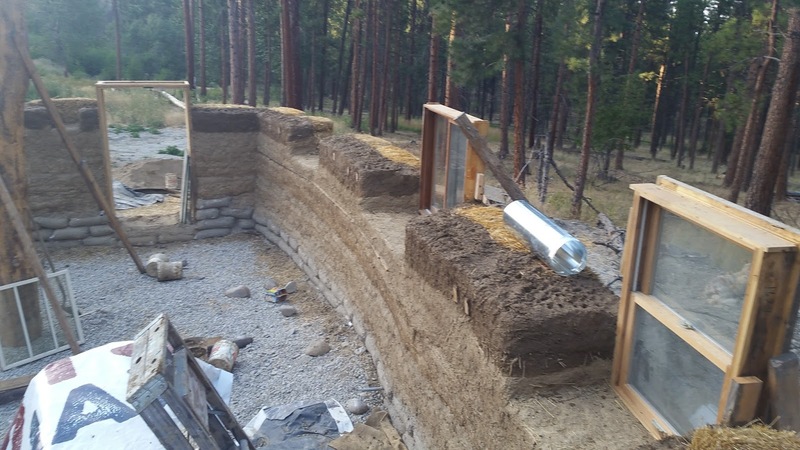 Balecob walls consist of a stacked bale wall with a thick cob layer to the inside and a thick cob plaster to the outside. Cob Cottage Company recommends using an extra sticky cob on the inside of the bales first so the rest of the wall can bond easily. We found that the sticky cob worked really well for the outside cob layer and the “filling-cob” used to bond bales together. Unlike our first cob house, most of the material was not from the building site, but from a local excavating company a few miles away. 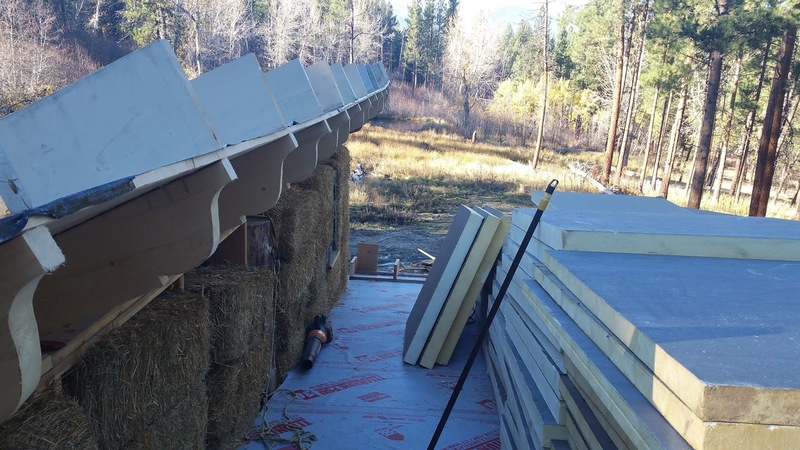 Because of the huge roof surface of the house, we opted out of laying down an epdm pond liner for a living roof and instead chose to roof in metal. This also has the added benefit of being a much lighter roofing material (3lbs per square foot with the insulation vs. 30lbs per square foot). We decided to build the roof as an unvented roofsince we were able to find a great deal on poly-iso insulation board on craigslist. Unvented roofs use closed cell insulation--non air permeable--instead of fiberglass batting, and do not rely on an attic space to prevent condensation issues. Our ceiling is supported from wall to wall by 2 massive 14” diameter beams spanning three posts. 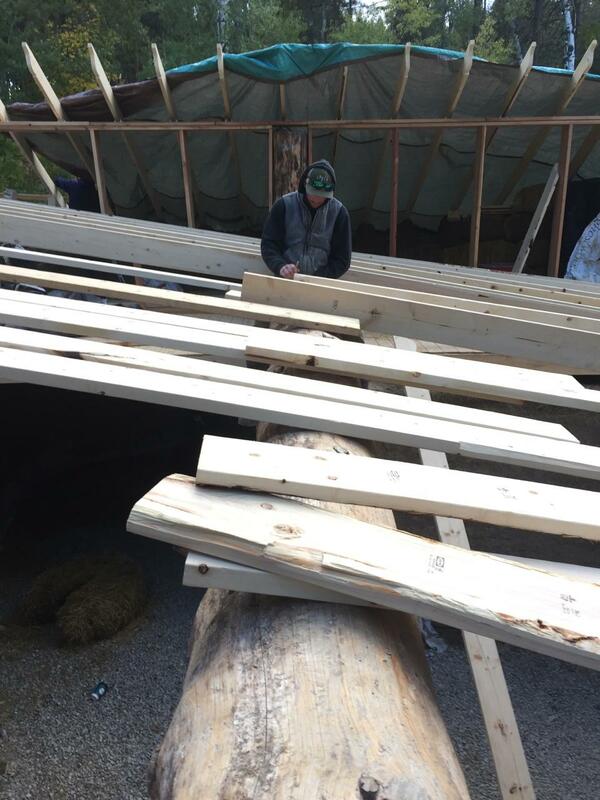 While the wood used for the ceiling and rafters was purchased from a local mill, the round wood was cut less than 100 yards away and hand peeled for free. The process of erecting these giant wooden rounds was quite the event, especially in the rain. The design for the loft of our house was altered several times during the course of the build. Initially the design called for our walls to be several feet taller, but we quickly realized that we did not have enough time to build our walls that high. 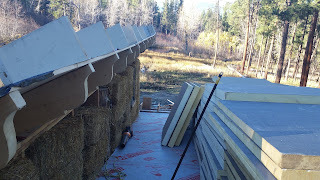 In what ended up being a pleasant looking design change, we built a small frame in straw-bale wall in our loft that has its own roof. The Majority of the loft is 5-6 feet tall and perfect for a future bedroom, but the downslope of the roofline is also lofted for storage space at 2-3 feet in height. 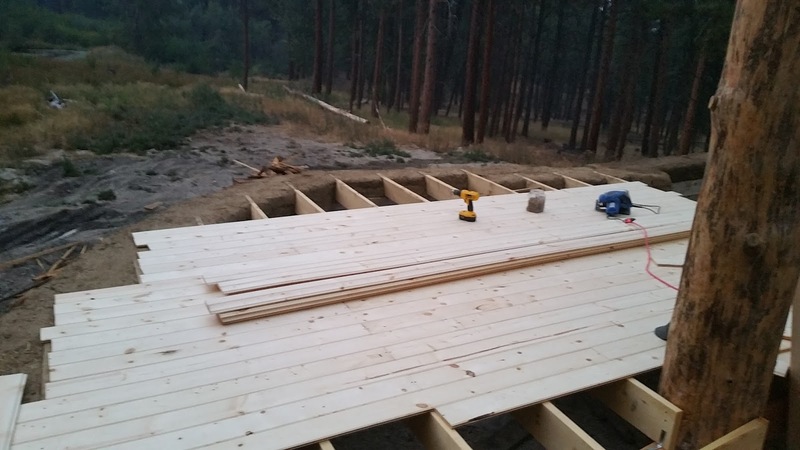 The floors are the same tongue and groove boards that we used for the ceiling, but we may yet put down another layer of hardwood for more sound proofing and protection. So what will happen in 2018? Next year we will work on all the finishing construction that we couldn't start this year. This includes installing the well pump, running solar panels and electric, plastering the inside and outside, pouring the earthen floors, building the rocket mass heater and bench, and applying tadelakt to the bathroom tub and walls. I’m sure there are a many more things that we will need to do, but hopefully we will have enough time left over for our first teaching workshop. Stay tuned for more info on what we accomplished this year and our plans for 2018. I think your hard work is paying off...great results. I'm so proud of you and Katherine! Outstanding, you guys. I'm so impressed with everything here. Thanks Jesse, I would love for you and your family to see everything once this house is done. Would love to see your projects and get some ideas from you. 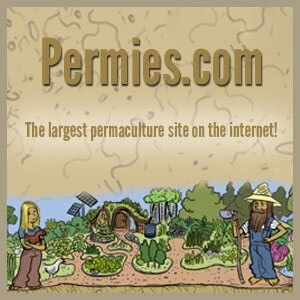 Keep up the awesome work and the awesome posts. The work you are doing on this house is a huge inspiration for the plans for my own house. 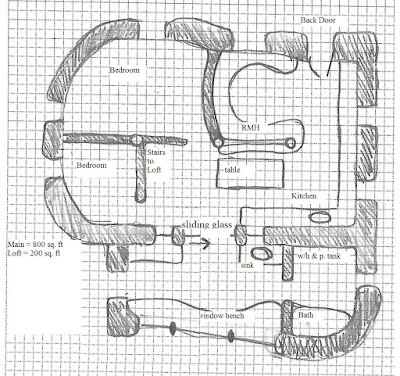 I think this design is brilliant and you're documenting it so well, it is so helpful! I can't wait to see more in 2018! Thanks Erin. We are doing small things right now while it is so cold still, but we'll try to make a new post this week. Looking forward to your updates. I still have trouble following how you constructed your roof. A wee sketch may be helpful to explain. We will make sure we do a better post on the roof. It was a lot of work and could be documented fully to help people doing similar projects.